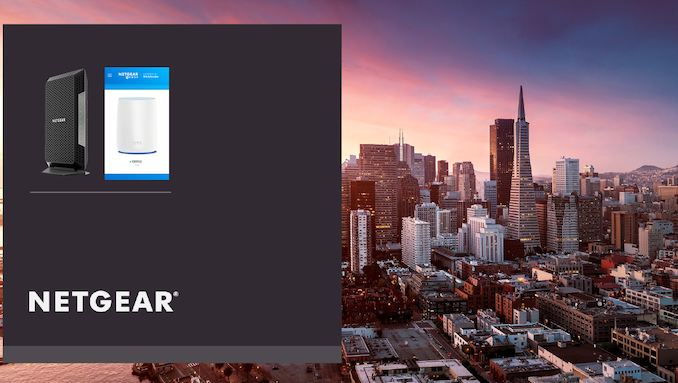 Netgear has a couple of interesting consumer products-related announcements at CES 2019 - one related to their cable modem lineup, and the other related to the Armor cybersecurity service offering. Back at CES 2017, Netgear had launched their first DOCSIS 3.1 cable modem, the CM1000. In that, I had mentioned that the Ethernet port for connecting the downstream router was still 1 Gbps, and hence, not taking full advantage of the capabilities of the Broadcom chipset. In any case, it was a moot point since there were no consumer routers capable of handling multi-gig ports (NBASE-T, or, even just link-aggregated WAN ports). Forward to 2019, the scenario is a little bit different. Netgear's own RAX80 (as well as a number of 802.11ax routers from other vendors) now come with multiple ports that can be link-aggregated for a WAN uplink (or, even just a 2.5 Gbps WAN port). This led Netgear to introduce the CM1100 cable modem (a Costco exclusive) in Q4 2018. The CM1100 was the first modem from Netgear to support dual gigabit Ethernet ports. However, it was not compatible with cable-bundled voice services. The new CM1150V Nighthawk is a DOCSIS 3.1 cable voice modem, and is very similar to the CM1100, except for the addition of two telephone ports. As the RAX80 takes off in the market, the new CM1150V (and the CM1100) can turn out to be excellent complementary additions. The CM1150V will be available later this month for $250. 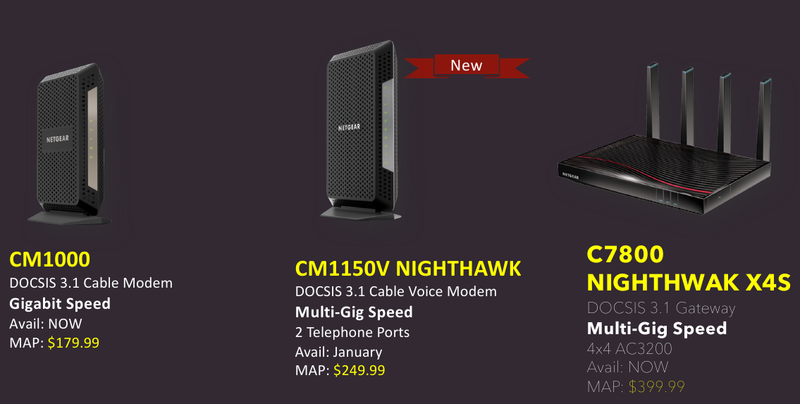 The product joins the two other non-exclusive ones in Netgear's DOCSIS 3.1 lineup - the CM1000 cable modem, and the C7800 Nighthawk X4S DOCSIS 3.1 gateway. Netgear launched the ARMOR cybersecurity service for select Nighthawk devices at CES 2018. Powered by BitDefender, it provides subscription-based protection for all home network and mobile devices. The service has steadily gained features over the last year. At CES 2019, Netgear announced that the Orbi lineup would soon become ARMOR-capable with a firmware upgrade in late Q1. Subscription rates remain unchanged at $70, but, the service now includes a copy of the Anti-virus & Anti-Theft Bitdefender Total Security software for all end devices in the network. This should be seen in the context of D-Link's EXO routers being bundled with McAfee's cybersecurity and anti-virus service. Based solely on that feature, we believe the D-Link / McAfee partnership provides better value for money when it comes to cybersecurity and anti-virus bundling. They're just describing how you fix any issues that come up (with a lisp). "Just give it a Nigth Wak."